Tiger Shark "Portrait of a Predator"
Well, it's been a busy spring/summer here on Puget Sound. My daughter, Kathryn, is heading off to college to study biology in a few weeks. With a love of nature and passion for animals and art, she will do very well in her future careers. 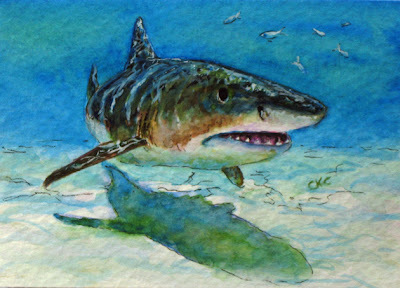 Sharks, of course, are a focus subject of mine. My passion for these creatures began in the summer of 1975 after I saw the movie, Jaws and was consumed with a hunger to know more about these ocean predators. I spent 12 years working as a biologist in the aquarium field and now enjoy painting these beautiful cartilaginous fish. So glad you enjoy my shark art. I shall have new paintings listed soon.